Historian Kate Hunter looks at the ways in which the opinions held by New Zealand and Australian soldiers towards each other shifted during the Gallipoli Campaign. 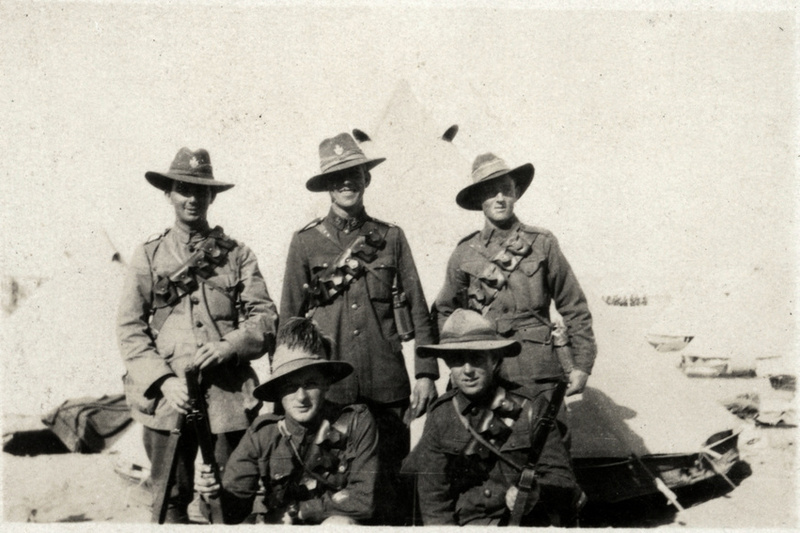 A group of unidentified Australian and New Zealand soldiers at Gallipoli. Image courtesy of the Australian War Memorial. ID number C03420. New Zealanders and Australians today claim common ownership of terms such as ‘Anzac’ and ‘digger’, but in 1915 soldiers in the New Zealand Expeditionary Force (NZEF) and the Australian Imperial Force (AIF) held a range of opinions about each other and not all were flattering. Mounted Riflemen at Cleopatra Camp, Alexandria. The soldier standing far right and the soldier kneeling on left are Australian Light Horsemen. The remainder are New Zealanders. Image courtesy of the New Zealand National Army Museum, accession number: 1992.745.4. The first great ruction between the Anzacs was over the Battle of the Wazza, a riot involving both countries’ troops in the red-light district of Cairo on Good Friday 1915. There was a great deal of blaming each other in the subsequent disciplinary hearings. When some of the protagonists found themselves together in an impromptu firing line on the Gallipoli peninsula three weeks later however, a truce had to be called before any cooperation could be sought. New Zealander Alfred Smith remembered the incident many decades later, and described the Aussies ‘having a talk’ and the New Zealanders deciding among themselves that staying with the Australians could only happen one way: an Australian addressed the New Zealanders, saying ‘You will forget about the Battle of the Wazza!’ Alfred recalls, ‘We all shook hands and said that we would forget bygones and we settled down’. 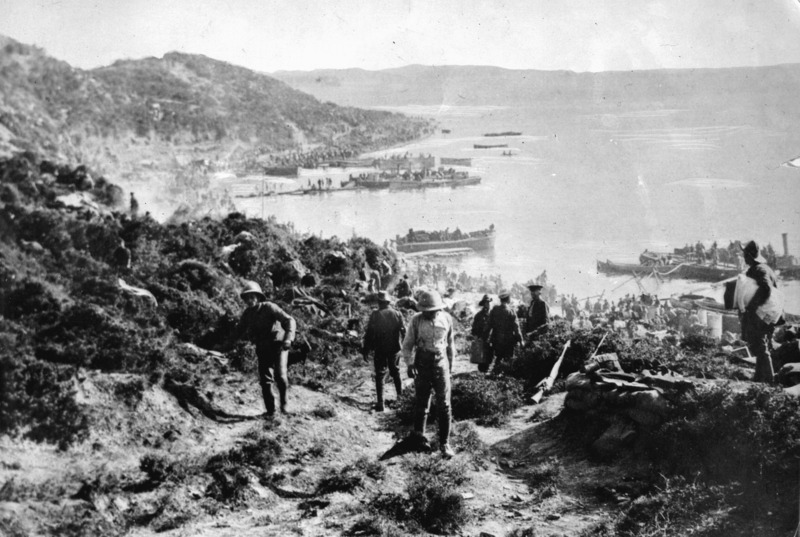 New Zealand and Australian soliders landing at Anzac Cove, Gallipoli, 25 April 1915. New Zealand Free Lance: Photographic prints and negatives. Ref: PAColl-5936-18. Alexander Turnbull Library, Wellington, New Zealand. Once on Gallipoli, Australians and New Zealanders continued to express a range of views about each other – often influenced by rank and situation – but generally, relations were friendly. One imperially minded soldier wrote to his mother in Dunedin about the landing on 25 April 1915 that ‘when this battle’s history comes to be written, the bravery of the New Zealand and Australian boys must ever stand as a monument to British bulldog tenacity and daring’. Their shared dislike of the British helped draw them together in the early weeks, and the common experience of combat helped put petty irritations in perspective. Canterbury soldier Raymond Baker was rescued by two Australian stretcher-bearers after lying in a line of mostly British wounded for three days in the summer heat. Baker’s uniform had been stripped from him, but the Australians recognized Baker’s fern-leaf charm around his neck, asked him if he was a ‘Pig Islander’ and scooped him out of the line and onto a waiting boat, probably saving Baker’s leg, and perhaps his life. 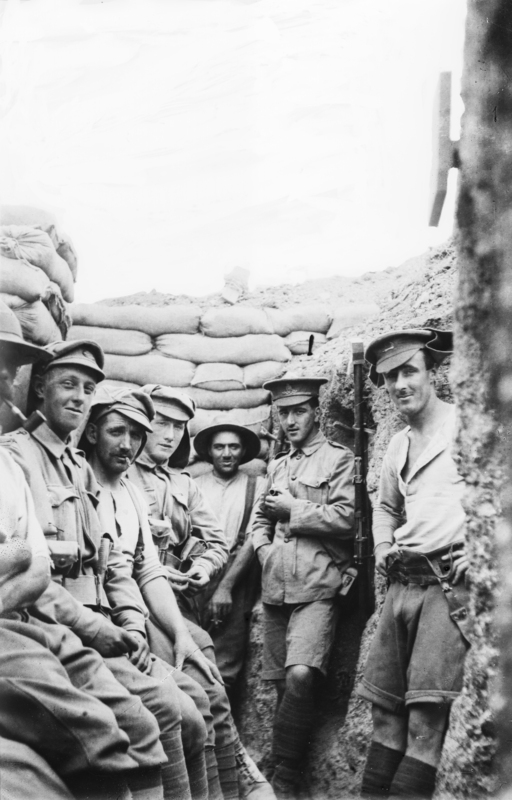 A group of unidentified Australian and New Zealand soldiers in a front line trench on the Gallipoli Peninsula. Standing in the narrow confines of a trench passage, with sandbags at the parapet above them, several of the men are smoking pipes and cigarettes. Image courtesy of the Australian War Memorial. ID number C03420. Despite examples of friendship and respect between New Zealanders and Australians, military authorities saw tensions between the two groups, as well as different characters of units and leadership styles, and hesitated to deploy them together both during and after Gallipoli. Some New Zealand soldiers described the Australians as having ‘no nerve’, and others regarded them as dare-devils who ‘make a sport of death’, and expressed an unease about serving with them. Rivalry and unfavourable comparisons would persist, but the experience of fighting side by side had significantly improved how each country’s soldiers viewed their trans-Tasman comrades.